Book launch week 1 has been an elated whirlwind... three incredible events, a fabulous review in the San Francisco Chronicle... hearing from readers from everywhere and nowhere...this is so much more than I ever imagined it could be. I am grateful and glowing all the time... when I'm not utterly exhausted. Worked full time through the book launch week, now have a week off from work as we head for Seattle and readings at Elliot Bay Book Company and the Nordic Heritage Museum. And what are sure to be a few lovely recuperative days on Vashon Island. Life has never moved this fast for me before. There hasn't been a moment to reflect much less post to my blog. Hopefully more soon. Time to get on the plane. In the meantime, some photos..
We had a great crowd at Diesel! It might appear to be odd timing, but it’s actually very auspicious. To put it simply, if it weren’t for my mother, I never would have written this book. I might have written a different novel, but not this one. My mother was, after all, responsible for turning me into the nutty Icelandophile that I have become. And – granted, this is not unusual for mothers – she was also my biggest fan. But her role went beyond motherly interest. I often consulted with her on small and large details of the book, drawing on her memories of her Icelandic-Canadian childhood. Although she did not live to see it, my mother, too, dreamed of this day when my book would be published. I feel her with me today. Happy birthday Mom! Now for the launch party – it’s going to be at Diesel Bookstore on College Avenue in Oakland at 7 pm tonight. 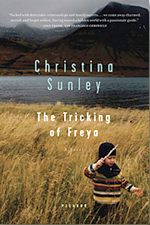 It marks the start of the book tour and the first time I’ll be reading from The Tricking of Freya. Lots of people I know and love will be there, and hopefully some people I don’t know as well. I’m a little worried I could get choked up when I stand up in front of this group and maybe even cry with happiness or something. So be it. It’s been a long road… Oliver and I are ready to celebrate! I dream that people will love my book. Not everyone; but some, deeply. I dream of plunging into my second novel. Then there are the night dreams. Silly anxiety dreams like this one: my entire wardrobe has been destroyed by an incompetent dry cleaner. I’m traipsing desperately from one overpriced boutique to another, trying to find something to wear for my book tour, but of course nothing fits. Finally I get to one store that is just about to close and I scream ALL I NEED IS BLACK SOCKS! The other night I dreamt that my father was still alive. Although he seemed fine and healthy, he was elderly and we both knew that he had reached the end of his life. He invited me into the apartment where he was living. I found it decorated with the most beautiful glass objects of all sizes – one sculpture so large it grazed the ceiling – in vivid translucent colors. As I walked through his space I realized that even though I’d never seen any of these things before, it made sense for him to have brought them all together, because he had always loved beauty. In his calm, orderly way, he brought out some boxes of things I could have when he was gone. Small boxes filled with shells and stones and stars from night skies that he’d collected through all the years of his lifetime.